Recorded by Leybl Kahn in 1954 New York. Though not in Yiddish, we present this week’s short ditty in the spirit of celebrating the upcoming holiday of Passover and as a contrast to last week’s Yiddish Khad-Gadyo. This is either the beginning of a longer Khad-gadyo song or perhaps simply a children’s rhyme based on khad-gadyo. (as I understand it, “dziengi” is slang for “cash”, from Russian – IG). 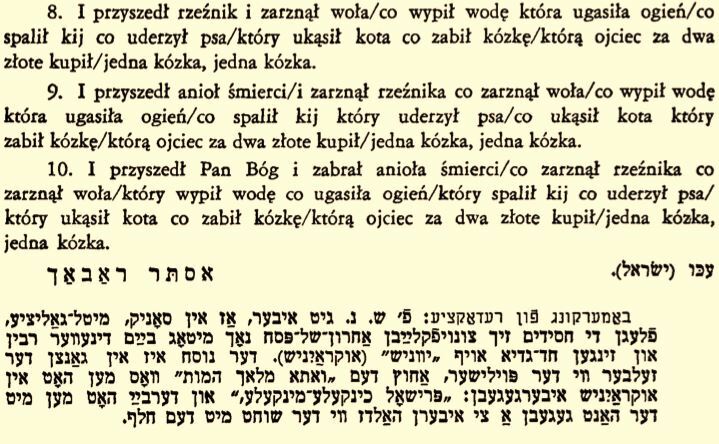 Below are lyrics published in Yivo-bleter 1952, volume 36 page 370 (http://www.hebrewbooks.org/pagefeed/hebrewbooks_org_43640_370.pdf), from a different Khad-gadyo in Polish from Sanok, Galicia. The commentary at the end also mentions a Ukrainian version. Readers – please let us know in the comments if you know of other Polish versions of Khad-gadyo.